When I was in Italy, last summer, I was intrigued by the growing popularity of what now Italians call "street food," using the English language expression to indicate, well... street food. When I was in Italy, last summer, I was intrigued by the growing popularity of what now Italians call "street food," using the English language expression to indicate, well... street food. Cibo di strada, in Italian. Street food is definitely not a novelty. The dwellers of ancient Roman cities, for instance, were able to eat out of their home: they could patronize taverns or buy ready-made snacks and meals to go from all kinds of roadside stalls. As kitchens were absent in most buildings where the lower classes lived, acquiring cooked food was a necessity. Such customs thrived for centuries, reflecting changes in times, political dynamics, and cultural environments. I remember, growing up as a child in Rome, to see people frying what in the US are known as zeppole in big oil vats on the street. To this day, it is not uncommon to see kiosks selling porchetta, delicious pork roasted with herb and spices, sliced, and served in crunchy bread rolls. In summer, watermelon sellers hawk their goods on the city curbs, a Godsend in the hot Roman nights. Side by side with these more traditional expressions, street food has found a new life in Italy. Entrepreneurs and creative chefs provide affordable and stimulating dishes that are inspired by the old ones, but often try to elevate them to respond to the preferences of their clientele. Their customers tend to be young and of the "foodie" conviction, always looking for affordable but intriguing flavor combinations that maintain some connection with the past, while using good, local ingredients. Healthier, safer production environments also increase the attractiveness of these new offerings. In fact, in Italy these days, street food - from takeaway pizza to fried rice arancini - is mostly sold not from stalls but out of small stores that enjoy a closer relationship to the street than regular restaurants. These eateries often have few seats available, forcing patrons to eat standing or to take away food. Some of the most interesting food in the Italy is now sold under this label. Gambero Rosso, one of the best known food and wine magazines in the country, has started publishing a Street Food guidebook, while websites such as Via dei Gourmet use street food as a distinct category, knowing that its users know precisely what they refer to. The gentrification of street food, while overall embraced as a positive evolution of the Italian culinary landscape, risks pushing aside food providers that are not able to speak the same language as the popular upstarts or are not willing to change their product and their sale methods to attract the clientele who are ready to buy the new "street food", with more originality, better quality, and possibly at higher prices. Such trends are also visible in the American landscape. Food trucks are enjoying growing success, as chefs and entrepreneurs consider them as viable alternative to brick and mortar restaurants, especially in cities where real estate costs are prohibitive. The food they offer is exciting, and they reflect the aesthetics and the communication modes of their clientele. It is not uncommon for food trucks to announce their locations on social media, and for their followers to look for them, wherever they are. The more traditional street vendors, those selling coffee and hot dogs, or the peddlers bringing fruits and vegetables of the curbs of disadvantaged neighborhoods, outside of the more glamorous background of the farmers' markets, are often ostracized and treated quite differently, including by the local authorities and the police. As I have discussed in a previous post, the Street Vendor Project has been raising funds and working with underprivileged sellers and hawker to represent them in policy and administrative discussion. We will discuss these changes and tensions at the New School, in a discussion panel on the history of street food in New York City. Street food has historically played a crucial role in the way New Yorkers produce, buy, and consume food. From carts bringing produce from nearby farms to immigrant vendors providing traditional foods to their community, and later to the city at large, food has always been present on the streets. 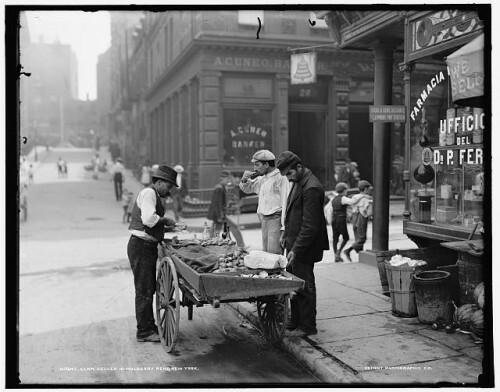 The panel will explore the past and present of street food in NYC, looking at culinary elements, culture, and the evolution of policy regulating the way New Yorkers were allowed to sell and access food in public spaces.